Fondue is a dish of melted cheese served in a communal pot or Fondue pot. Cheese Fondue refers to melted Cheese, usually served with dry bread and vegetable. There are many interesting stories behind the origin of this dish. That some residents in Alpes area has run out of their food, yet the dry bread and cheese with unpleasant smell were left. This came to an idea of melting the Cheese and dipping the dry bread in order to make the bread easier to digest. Surprisingly, they are really a great combination which finally comes to a name: Cheese Fondue. Nowadays, depends on the area, some recipes are added Wine, Garlic and so on, to make the dish more delicious and appealing. *Please note that the color can be varied comparing to the picture. Cheese Fondue – with the closer name of Cheese Hotpot. Original from a cold climate, Cheese Fondue brings its warmth to a winter party. Cheese Fondue is a liquid-form cheese, smooth and warm, often used to dip dry bread or vegetables. Combined with 3 famous cheese and white wine, Cheese Fondue from 4P's Pizza is a gentle and subtle mix of soft texture and distinctive flavor intermixing wine. 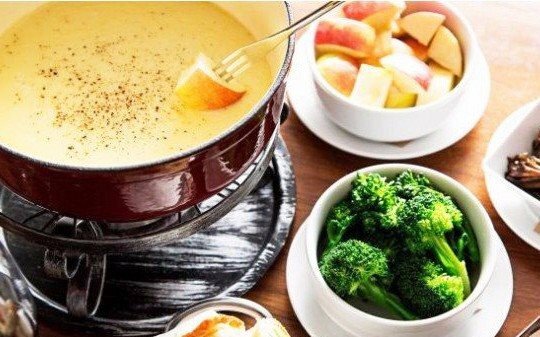 Cheese Fondue is not hurriedly rushed, Cheese Fondue just slowly spreads out in your mouth and save the charm of the place where it glances. Cheese Fondue is best known for its use with dry bread cut into small cubes. Cheese fondue melted cheese and greasy fragrance of white wine penetrated into each groove of dry bread as a warm stream which can make even the rocks become softer. 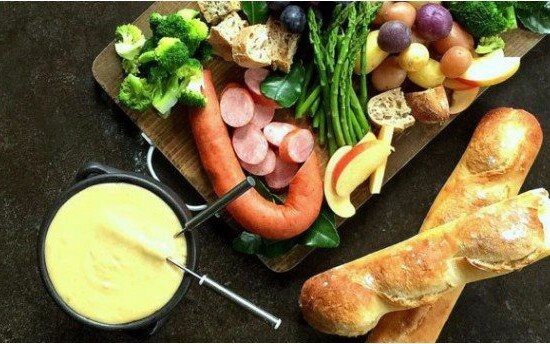 With bread, Cheese Fondue is like a lovely girl who is capable of melting any hard sandwiches. 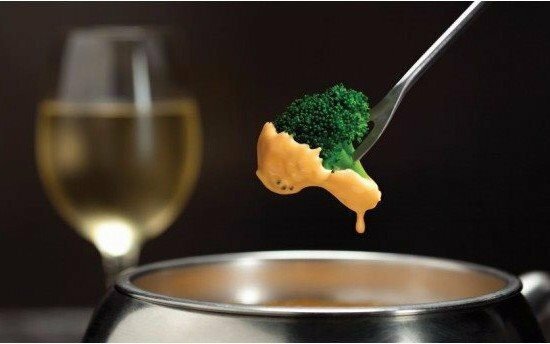 However, when combined with vegetables, Cheese Fondue is like lava from a volcano mix with fresh water. That when using vegetable with dip cheese, warm Cheese Fondue outside is as if covering all the flavor of vegetables, then suddenly the fresh sweet taste of vegetables interrupted as a high note between the warm bass tone. During the meal, Cheese Fondue is boiled in a special pot, heated by candles’ fire, to keep warmth and smoothness of the Cheese. The Fondue pot is made from porcelain, structured in two parts: the bottom of the hollow, which can be placed in the candle and the small boiler above. 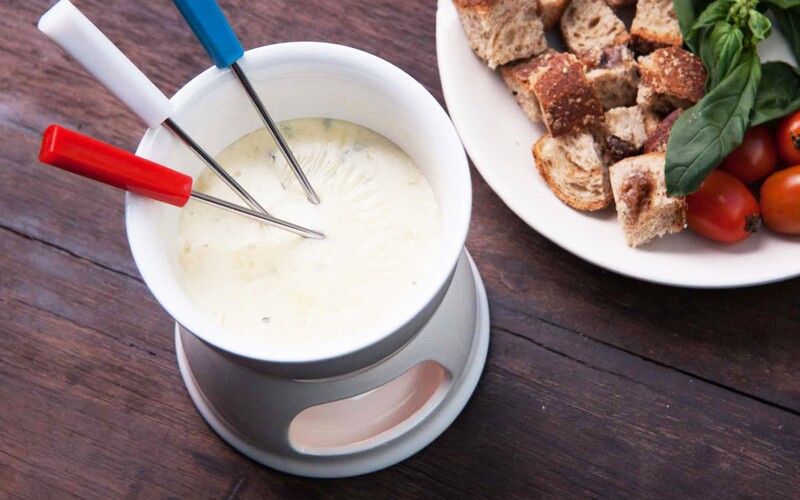 Fondue Pot must be neither too thick nor too thin to keep the Cheese Fondue's temperature stable and warm enough for Cheese Fondues to have a flexible structure. How To Have A Great Cheese Fondue At Home? Method 1: Put it in the microwave, heat up in 30 seconds. Method 2: Preheat the pan, heat up the cheese at low temperature until it is totally smelt. Step 4: Pour Cheese into the pot and keep it warm during the meal. Step 5: Let’s enjoy your savory Cheese Fondue. *Cheese Fondue is great combining with boiled vegetables, grill meat, hams, dry bread or fresh fruit cut into small cube. Storage condition: Keep in refrigerator. Expiration period: 2 days after the production date.